Use this easy macramé technique to embellish a metal ball chain with a spiral of shiny beads. 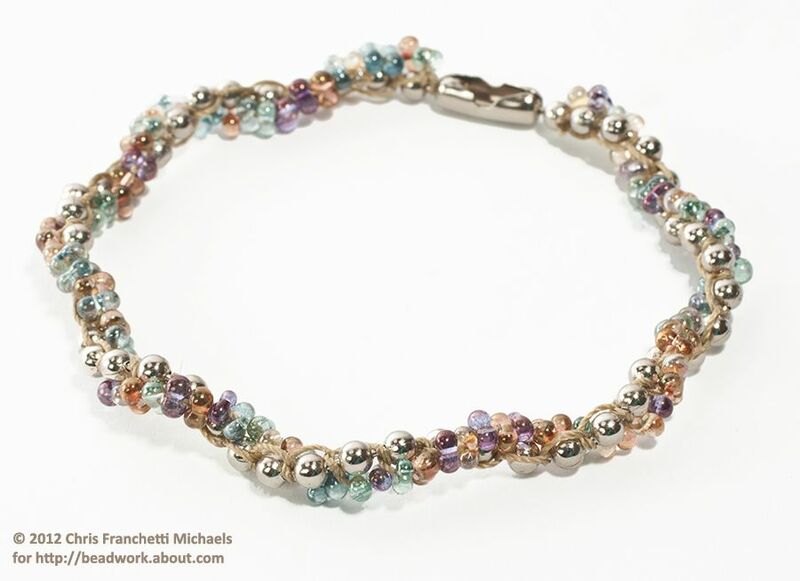 In this tutorial, we use farfalle beads and thin, strong beading cord. Keep in mind that you can experiment with different shapes of beads, sizes and finishes of ball chain, and different cord colors. Please click on any image in this tutorial for a larger view. * I used luminous luster mix, like these listed by KentOBead on Etsy. If you can't find that color in stock, search Etsy for other interesting colors. Use wire cutters to cut a length of chain that is your desired total length plus six more metal balls. To make the cut, cut the link between two balls on the chain. Tip: The longer your piece is, the more challenging it can be to create a spiral with consistent tension. I recommend starting with a bracelet (rather than a necklace) and completing it within one session. I find that when I split this project up into separate sessions, my knotting tension changes a little from session to session, which creates inconsistent spirals. Attach the clasp to one end of the chain. Do this by sliding the very last ball into the opening in the clasp tube, and then pulling the chain toward one end of the tube until it snaps into place. If it won't snap, use the tips of chain nose pliers to make the clasp tube slightly wider. Clip the chain clasp down on the clipboard. Use masking tape to tack down the chain near the bottom end of the clipboard. Leave enough slack in the chain that you can slide a finger between the chain and the board. Use scissors to cut a length of beading cord that is about five times the length of your chain. Center the cord beneath the chain on the clipboard, and position it between the first two metal balls just below the clasp. Tie a square knot. You're now ready to make your first macramé half knot. It's called a half knot because it's exactly one half of a square knot. Start by holding the two ends of the cord out to the sides, one on each side of the ball chain. I'll refer to these as the left cord and the right cord. Bring the right cord beneath the chain and then over the left cord. Pull both cords away from each other, out to the sides, and position them so that the knot cinches down in the space between the next two metal balls on the chain. You now have all the skills you need to complete your beading. For the next knot, pick up two beads, slide them down all the way, and tie another half knot between the next two metal balls on the chain. Keep stringing pairs of beads and making knots. Be sure to begin each half knot by passing whichever cord is on the right beneath the chain. For a smooth look, cinch down each knot as tight as you can. After an inch or so of knots, your beads will begin to spiral around the chain. If the spiral ever gets in your way as you make knots, rotate the clasp (which is clipped to the clipboard) toward the left to reposition the chain. As you near the end of the chain, take the chain out of the clipboard, turn it around, and clip it back onto the clipboard in the opposite direction. Bring the clip on your board down between the last and second-from-last metal balls on the chain. Then, spin the clipboard around so that you can continue working in the same direction (toward you). Stop when there are six metal balls left of the chain. Tie a tight square knot around the link between the next two metal balls in the chain. Apply a tiny drop of instant bond glue to the knot, and allow the glue to dry for several seconds. Use scissors to trim the cord close to the knot. Use side cutters to cut off the last four metal balls on the chain. Your bracelet, necklace, or anklet is now complete. Secure the clasp the same way you originally attached it in Step 2.